C.A.Y.A. stands for "Come As You Are." C.A.Y.A. 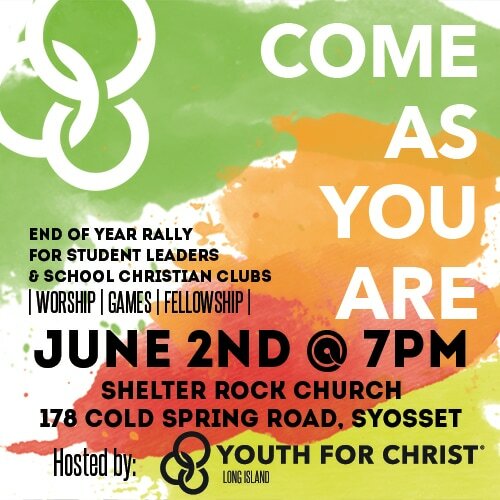 is an end of the school year student-led rally bringing together high school christian clubs and Campus Life groups for one night to be encouraged and to be connected with other Christian high school students across Long Island. It is a time for games, great worship, sharing what God is done, special guest speakers challenging all attending, food and hanging afterwards! What Time? 7 PM Start, come early if you are a student and want to help set up! Who? Grades 6th-12th, YFC Alumni Are welcome too!